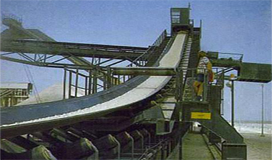 Eurekon Chevron Cleated Conveyor Belts have the advantage of cleats being integrally molded as a part of the top surface, preventing the materials from sliding backwards and are suitable for jointing by vulcanizing or by mechanical fasteners. 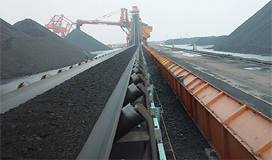 Chevron belts are used for handling bulk material. While using a flat belt, the maximum angle of inclination is about 15-20°, but using a chevron belt this enables the inclination upto about 40°. The advantage of high angle inclination is that less space is needed to reach desired conveying height. • Chevron cleats are hot vulcanized onto base belts and manufactured in a flexible and wear resistant black rubber quality. Slittable Cleated Belts have integrally molded cleats. Patterns are designed to aggressively transfer free-flowing material. Pattern choice depends on the material being carried and the design of the conveyor. Belt is available in 2 or 3 ply, MOR (Moderately Oil Resistant) compound. Chevron Y Cleat Belts are used primarily when the angle of incline becomes too steep for a smooth conventional conveyor belt. The belt is fitted with integrally molded cleats which prevent the material from sliding backwards as would be the case with a smooth surface belt. Different cleat designs allow the carrying of many types of material, from bulk solids to unit loads. Y Cleat Belts are produced with integrally molded profiles fitted into the belt's top cover during manufacture. The shape of the chevron profiles has been carefully designed to assure excellent smooth return side support on full width return idlers and good self cleaning properties. Incline angles achievable depend upon the material's characteristics and the type of belt selected.